Parenting matters. It matters a lot. Children are the future and our future will literally be in their hands one day as they become the leaders of society. So, we owe it to both them and ourselves to give parenting our best shot. I have always believed it’s a mutual journey of personal development both for yourself and your child. It is a journey that will feel like it is going by in the blink of an eye at times, and at others it will feel interminable. For this I have a saying: The days may be long but the years are few. Make the most of each, and every, one! Amazingly, one day you will miss some of the tedious, minute details of daily parenting! It is a journey that will shape each of you, hopefully always ending with a positive outcome although the path to get there may not always be smooth and, actually, a few bumps in the road can be really good preparation for your child’s future. It is a journey that will require you to keep up with a fast-changing world. Technology stands still for no-one anymore and we all need to become tech-savvy to keep up, and to remain relevant, as the world evolves and as we guide our children to use technology responsibly. It’s a journey that will demand that you continuously do a dynamic balancing act because there is no such thing as perfect balance. Take the words Supermom and Superdad out of our vocabulary now! To be effective parents today we need less perfection and more connection. It is a journey that will teach you more about yourself every day as you are in the process of helping your child discover who they are. May you parent out of love, not fear, with the aim of helping every family member to expand, evolve and grow – to become more than they were before! It is a journey that will take you and your child into the future. Into the world of the Fourth Industrial Revolution that will be driven by technology and is filled with possibilities we have never seen before. 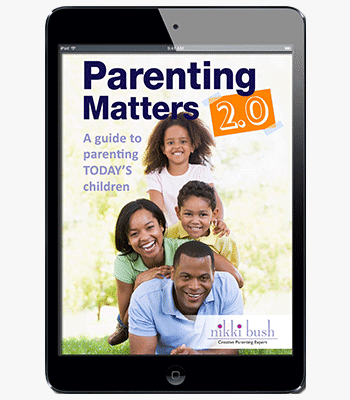 Parenting Matters 2.0 – A guide for parenting TODAY’S children, consists of 20 stand-alone, short chapters that cover many of the topics mentioned above. You can dip in wherever you like as they can be read in any order. I hope they will provide you with fresh insights and inspiration to guide you on your way.